From the fifth surviving Belfast News Letter. 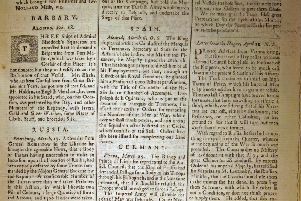 The edition is dated January 9 1738 but that is in fact Jan 20 1739 in the modern calendar, which Britain adopted in the 1750s. Under the old calendar the new year did not begin until March. The Prince William, Capt. Sacket from Antigua, who arrived in the Downs on Tuesday last, met in his Passage from Antigua, in Lat. 41 a very violent Storm, that last six Days, during which she ship’d several Seas, one of which stav’d both his Boats, and wash’d them overboard, together with the spare Topmasts, Yards, &c. Binnacle, Fire-place, Hen-coops, and almost every thing on Deck, broke the Tiller, and bruised the Man at the Helm very much, stav’d some Casks of Rum, tore up one of her Quarters, and damaged the Ship so much, that it was with the greatest Care and Difficulty that she was brought home, having, after the above Misfortune, lain above two Hours with her Gunnel under Water. In the Latitude 49 Degrees 30 Minutes about 80 Leagues to the Westward of the Lizard, on the 9th Instant, a Sloop belonging to Mr. Holdsworth of Dartmouth, who is arrived at Plymouth, spoke with the Alexander, Capt. Russell, bound from Maryland to London, in a very bad Condition. The following is an Extract of a Letter from Capt. Russell to his Owner, viz. That on the 8th of November, in the Latitude 44 Degrees, and Longitude 35 West from London, as we were scudding under a Foresail, a dreadful Sea broke on our Ship, which stove down the Stern even with the Tiller, our Mizen-yard in three Piecces (sic), the Bowsprit at the Gamoning. With this dreadful Sea perished every Soul that was upon Deck, with 100 living Creatures besides. The Jamaica Frigate, Capt. Smith, bound from Jamaica, was seen Nov. 20, in Lat. 36, having lost her Rudder, and received other Damage. Near Calais is stranded the Ship commanded by Cornelius Beurs, bound from Amsterdam for Lisbon, and near that Place is lost the Ship commanded by Barnet Moller, bound from Hamburgh for Oporto. A Ship is lost off of Bilboa, loaded with Fish.